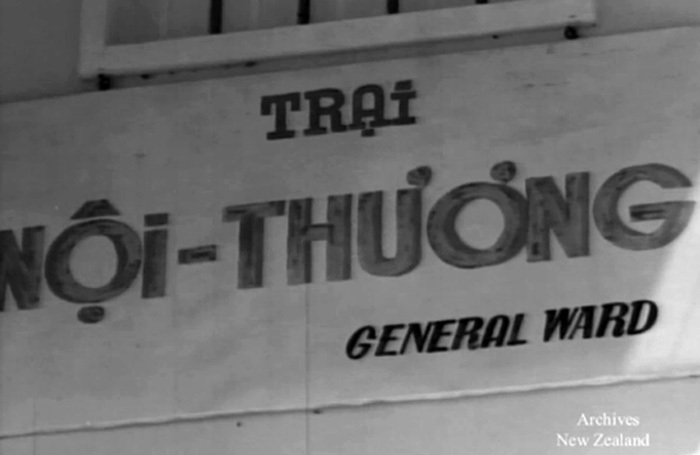 News coverage of Qui Nhon Hospital in 1965. Badly injured Vietmanese patients, including blinded children, are attended by New Zealand medical staff. The sun shines brightly on a hospital, but for some the dawn will be a long time in coming. And here, New Zealanders are involved too. Sir Stephen Weir moves through the overcrowded wards with the medical team. Lying three to a bed, 90% of these people are war casualties. Dr Jack Enwright, an Auckland surgeon, and the New Zealand medical team operate on 200 cases a month. For many there’s no place on a bed. Even under these appalling conditions, Sister Gladys Taylor and Sister Rae Thomas still have a smile for the patients. For Dr Ian Hutchinson, examining a four year old child blinded by shrapnel is a tragic but everyday occurrence. For a lot of these innocent sufferers, life will be a long, pain-filled darkness. This is the face of South East Asia today. Her agony is that of hunger and disease, and of bitter and bloody war. There is no simple cure – maybe there’s no cure at all, but there is hope. And towards this New Zealand is making a small but worthwhile contribution.